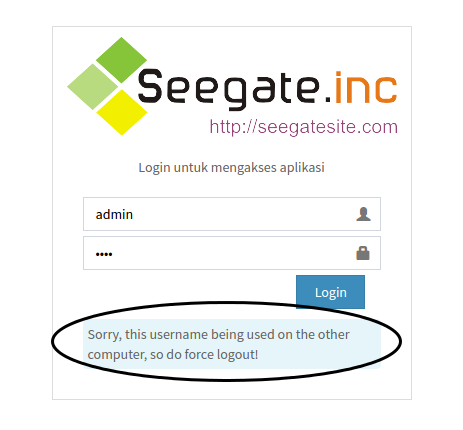 Seegatesite, how to force user to log out I apply some project website that I created. This article is a continuation of the articles that I have written before How Do I Check the PHP Session Realtime Using Jquery And Mousedown Event. In addition, this technique can also be used to disable / do banned user via admin panel. The essence of this method is to add a unique value to the database, then the script will do the checking every time the user clicks on the HTML element. The system will always perform to update unique values into the database when a user login in the system. And each time the user clicks on the HTML element, system checks to see if a unique value in the database same with the value stored in the global variable ($_SESSION). If different, then the entire session will be destroyed. The following is the complete tutorial. 3. Save the above unique value into the field unique_auth and global variables $_SESSION[‘unique_auth’] When user do log in. Please try on your browser and see the results. Thus my simple way to force log out active users. If you have a better solution, please give me feedback on the comment form below.